XTFX were suitably impressed when we dropped in to check out the progress of The Other Planet’s flagship finishing suite, nearing completion at their Leeds premises. Having knocked several rooms together, the space they’ve created is imposing, to say the least, rivalling anything on offer in Soho. Taking advantage of Quantel Rio’s scalability, Phil has turned it up to 11, installing an additional NVIDIA GPU for good measure. A Barco projector completes the picture. A long – time investor in Quantel / SAM solutions and seasoned beta tester, Phil put Quantel Rio through its paces on the 4K post for Formidable Productions’ feature film ‘Between Two Worlds’, a romantic comedy featuring singer Example in his acting debut. They’re currently in post on MoliFilms’ ’Gloves Off’ a gritty comedy drama about boxing in the traveler community shot in local studios. “We’re editing at the moment with finishing and delivery early in 2016”, says Phil. Further feature film and drama projects are scheduled to follow in quick succession. The client-centered approach is paying off: “Word is getting out to other production companies, hence the expansion”, says Chris, “The knowledge that we can deliver gives our clients the confidence to base themselves here”. Storage infrastructure is provided by Elements with plans to expand on the current 96TB capacity in 2016, also acting as a nearline to the Quantel Rio which will use its own attached storage for the interactive 4K work. The Other Planet service the full gamut from commercials to factual, TV drama and cinema. Recent documentaries projects include ‘The Yorkshire Vet’ and ‘Body Donors’ (Channel 5) for Daisybeck Studios, and ‘India’s Frontier Railways’ (BBC 4) for 3Di Television and they recently completed Kay Mellor’s drama ‘The Syndicate’ (BBC 1) for Rollem Productions. 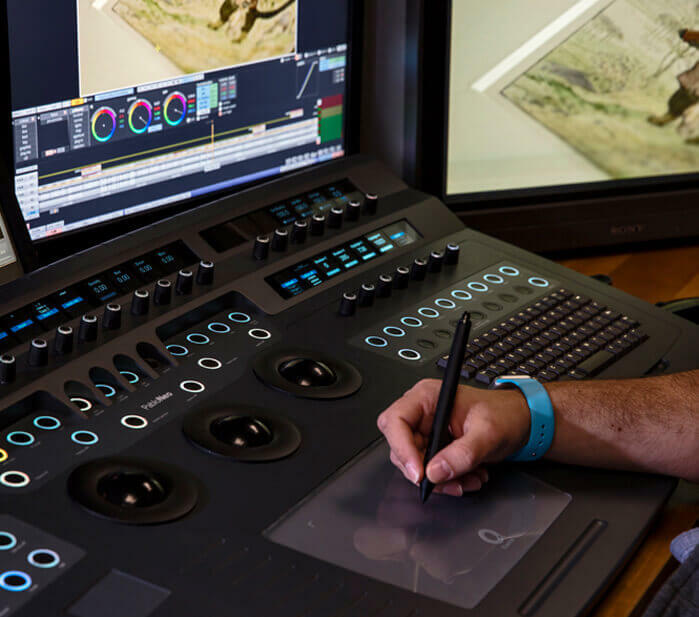 Full service post is amply resourced; 8 Avid systems handle offline editing and offer flexibility to documentary makers on tighter budgets, with a Nuke pipeline for VFX and After Effects for motion graphics. While Phil and his partners have a strong technical background and are largely self-sufficient engineering-wise he appreciates. Phil and Chris firmly believe that the key to effective finishing is building a relationship with the DOP. Chris: “We’ve noticed a drop-off in client attendance compared to the old days. In general clients trust us to get everything sorted and come in for review and approval. The exception is DOPs who remain closely involved in the grade. Whatever their approach, a treat awaits DOPs in The Other Planet’s uncompromising finishing suite, bringing a Soho-style client experience to the North for the first time.